Stardew Valley created by ConcernedApe. Precocious yet adventurous, shy yet a little daring, quiet yet friendly, Jas is a contrary little thing considering her age. One of the two kids living in Pelican Town at the beginning of a game of Stardew Valley, Jas wants nothing to do with the new farming arrival - but with a little time, a little effort, and a few bribes, she'll open up to you. Jas lives at Marnie's Ranch with her aunt, Marnie, and her cousin, Shane. Much of the year she spends in the company of Penny, her part-time teacher, and playing with her friend and fellow student Vincent. Jas is also willing to play on her own, and shows few compunctions towards wandering away from her aunt's home and exploring the fields. Jas' birthday is on the 4th of Summer. Jas is your typical kid, and much like Vincent she loves sweets. You can easily win her heart with a stream of Pink Cakes and Plum Puddings, and she's just as happy to accept Chocolate Cake, Ice Cream, Miner's Treats, and Cookies. Jas also loves flowers, topping out with the Fairy Rose but also loving anything you can grow or forage. Precious gemstones also go over well. 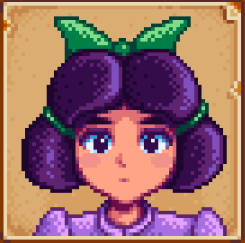 Jas has next to no interest whatsoever in any other food items, and will dislike fruits, veggies, milk, eggs, and pretty much anything else you can grow on your farm. She's particularly offended by Honey, for some reason. Jas spends much of her days in the company of Penny and Vincent, either walking to and from the Library or inside the building, studying from 11 am 'til roughly 2 pm. She'll do this on Tuesdays, Wednesdays, and Fridays, except during the Summer. When Jas isn't working away in the Library she can sometimes be found at the northern park with Penny and Vincent or, during the Winter, to the west of Marnie's Ranch. Aside from the occasional park visits Jas almost never goes north of the road that runs from Marnie's Farm to the Library. So far as I've seen Jas does not have any events of her own, occasionally participating in Penny's events.